How Easy Is It To Vote in Florida? Tallahassee, FL – A new study from the Advancement Project shows that minorities faced greater wait times during the 2012 election. As the Tampa Bay Times said in a recent editorial, "The Florida study is a powerful demonstration of what can happen when lawmakers seek to exploit a perceived partisan advantage by diluting minority voting strength." 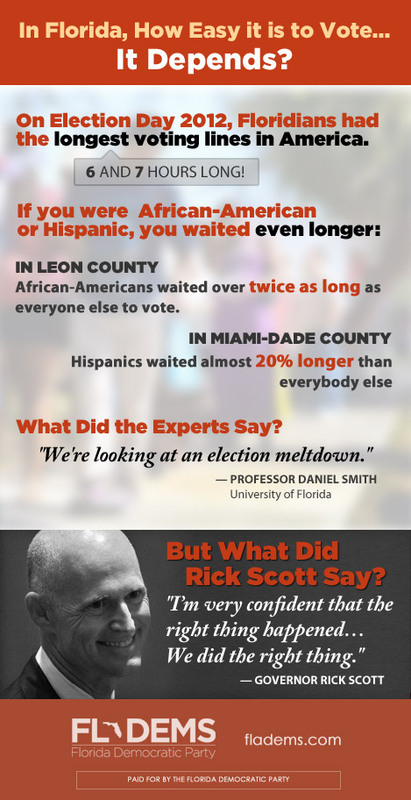 Rick Scott and the GOP made it clear in 2011 that they wanted to make voting as difficult as possible and the results speak for themselves.